LONDON — During a decade in management, Mauricio Pochettino has never lifted a trophy. The Argentine is still one of the most coveted coaches in world soccer. Whenever a job comes up at a leading club, you can be sure Pochettino's name will be in the mix for the vacancy. From Real Madrid to Paris Saint-Germain and, mostly notably recently, Manchester United. 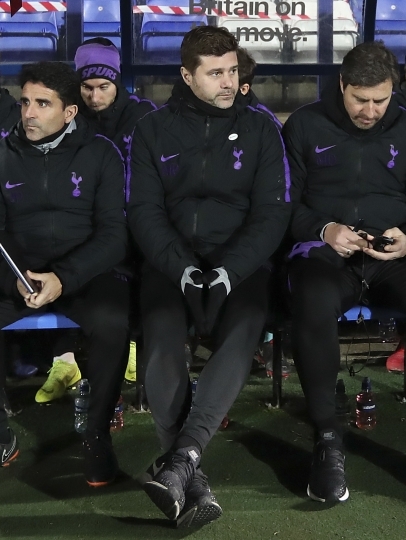 Yet, Pochettino remains in the dugout at Tottenham, a bond of loyalty that is being increasingly stretched by a lack of financial backing in the transfer market to end that trophy drought. 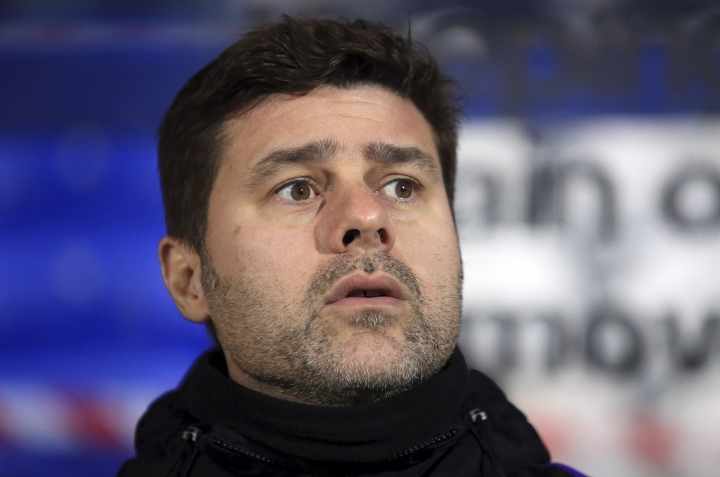 Pochettino on Sunday tests himself against the club that could tempt him away from Tottenham in the summer, and the manager trying to show he has the credentials to keep the job: Ole Gunnar Solskjaer's Manchester United. When Jose Mourinho was fired by United in December, Pochettino emerged as the favorite to be hired his long-term successor at the end of the season. But Solskjaer has given the owning Glazer family something to think about. Brought in to halt the decline as a short-term fix, the former United striker has opened with five successive victories, equaling the club record for a new manager. A victory over Tottenham at Wembley Stadium would be a significant statement of Solskjaer's credentials. The fact Tottenham is now viewed as a tough test for United demonstrates the club's progress under Pochettino. During the Alex Ferguson-era at United, the manager was reputed to have told his players "Lads, it's Tottenham," in a team-talk dismissing the north London club as soft. By the time Tottenham overwhelmed Mourinho's United 3-0 at Old Trafford in August, it was clear just how Pochettino has transformed his team into a force to be reckoned with. On meager resources, by Premier League standards. Since the 46-year-old Pochettino was hired from Southampton in 2014, Tottenham only has a net transfer spend of 29 million pounds ($37 million) — taking into account incomings and departures. By comparison in the last five years, Manchester City has benefited from net spending of 518 million pounds and United has splurged 466 million pounds. Arsenal and Chelsea have topped 200 million pounds, while Liverpool's net spend is 183 million pounds. Tottenham has finished above every other team at some point under Pochettino, enjoying three successive top-four appearance to secure a route into the lucrative Champions League. Before Pochettino's arrival, Tottenham had only played once in the Champions League in the 2010-11 season. Even after becoming the first Premier League team not to sign a player since the summer transfer window was introduced in 2003, Tottenham is still holding its own in third place. Liverpool is six points ahead and City only two points in front of Tottenham. Chelsea is four points back, Arsenal a further three points adrift and United is still in sixth place despite the revival under Solskjaer. 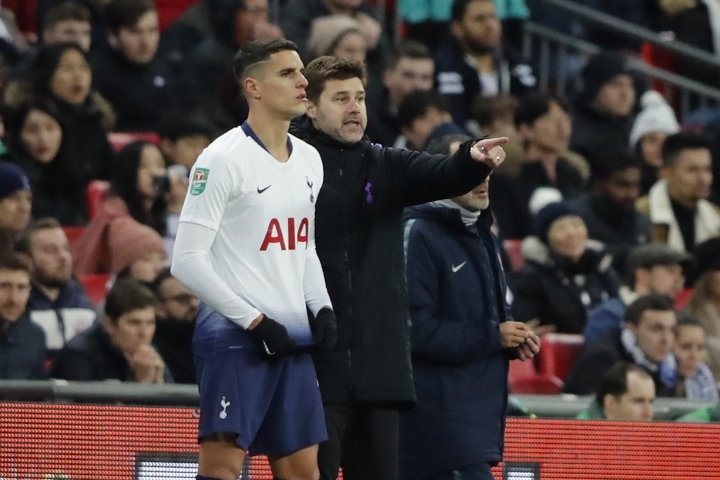 "He has done a very good job," Solskjaer said Thursday about Pochettino. "That speculation (about the United job) is there for a reason because he has done well but it's not my job to rate managers, my focus is on me and my team." Pochettino is constantly reminding people just what he is competing against. "Sometimes people talk about winning titles," he said this week. "One thing is to reduce the gap with the top four, to be competitive, to create a team capable of fighting with the big sides. But if after we want to win titles we need to operate in a different way. At the moment we operate in the same way as we operated in five years ago when we arrived." That means no lavish spending. And there is a new stadium to pay for and costs that project have spiraled to nearer $1 billion as the construction has stalled. "I don't have money," Pochettino said, looking ahead to the January transfer window. Tottenham does have a wealthy owner in Joe Lewis, the Bahamas-based British tycoon. But he can't match the Abu Dhabi state-backed spending of Manchester City, the commercial juggernaut of Manchester United or the Roman Abramovich oil-funding revolution at Chelsea. "We're doing all these fantastic things with our own resources," Pochettino said. "It's important to make that clear when we compare with another team." That means being forced to mine the club's academy for talent, rather than just resorting to the transfer market. But that has paid off. Harry Kane graduated from the youth team and last year collected the Golden Boot as top scorer at the World Cup with England. 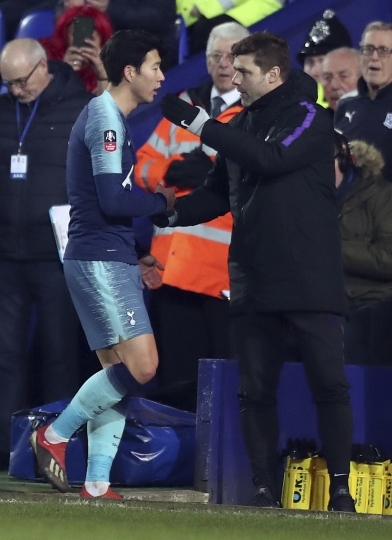 "You just want to perform for him, work hard for him, win for him," Kane said about Pochettino. "He's very passionate. You can tell sometimes he wants to be out there himself, putting in tackles, running about." Oliver Skipp is the latest teenager to earn a promotion to the first team, last month becoming the 13th academy player to make a first-team debut under Pochettino. Young players know they will get a chance under Pochettino. Music to the ears of many clubs, especially ones like United that have little to show for the huge outlay under Mourinho. Tottenham chairman Daniel Levy is once again facing the possibility of losing Pochettino, even though the manager only signed a new five-year contract in May after a third-place finish. "He is a worried man because he is jealous about me," Pochettino quipped shortly after Mourinho was fired by United last month. The club blocked questions about a potential departure at a recent news conference. But Pochettino could determine that he has hit a ceiling at Tottenham, where it getting harder to land the club's first league title in 1961. Pochettino lost his only cup final with Tottenham when Chelsea lifted the League Cup in 2015. He hasn't collected a trophy since his playing days at Espanyol in Spain. "I can see in the future Tottenham winning trophies," Pochettino said. "I don't know if that will be with us, without us, in one year, in five years." Sunday's result against United could go some way to determining that.